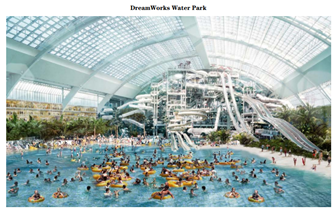 A brand new theme park & water park megacomplex (“American Dream”) is opening early ’19 in between SIX’s largest park (Great Adventure in NJ) and its main population center. This development has gone unnoticed by SIX investors. The project was only recently repurposed to focus on theme parks, and just a few weeks ago secured funding and resumed construction. Great Adventure is SIX's largest park. With high operating and financial leverage, we believe a 30% attendance impact at this park could destroy 30% of SIX's total free cash flow. Additionally, in 2018/9 SIX runs out of NOLs and will resume paying cash taxes, an additional ~30% hit to free cash flow. 2019 is shaping up to be a downward reset for SIX cash flow. SIX’s valuation is high and the dividend could be at risk. How does this threaten Great Adventure’s population basin? 1) A description of the new American Dream megacomplex. This is the American Dream project (originally “Xanadu”). It began close to 15 years ago by Mills & Mack-Cali, then Colony took control in ’06, but the project went under in ’09 despite significant construction progress (reported as 80% structurally complete with $2B invested building the main structures). Anyone who drives through NJ has seen this hulking structure with halted construction activity next to MetLife Stadium. In 2011 Triple Five took the project over - they run the Mall of America & West Edmonton megamalls. 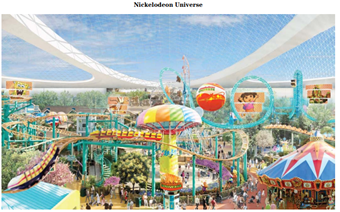 It had always been primarily a retail development, but given all of retail’s struggles, it has now been re-envisioned as a theme park, water park, and entertainment anchored mega-complex. American Dream completed a $3B funding in the past month which now funds the revised entertainment/theme park/retail complex to completion. The park is scheduled to open March 2019. Minigolf, Ice rink, observation wheel etc. American Dream just closed the $3B financing needed to finish the project ($1.7B construction loan via Goldman and JP Morgan in May ’17, $1.1B tax exempt bonds via Goldman and JP Morgan closed June 22nd ’17). With full funding to completion in hand, construction is back underway as of the last few weeks. At this point it appears highly likely this project will open. It is backed by Triple Five developments, a reputable developer owned by the Ghermezian family – they also own the Mall of America in Minnesota and West Edmonton mall in Alberta. Family members have guaranteed the American Dream debt personally and cross collateralized it with their two existing malls – which suggests they are pretty certain this completes (otherwise they risk bankruptcy). According to various news sources, the Ghermezians are worth $2 billion. If there is some construction cost overrun it seems likely to get funded before they walk away from a project with $5B sunk costs in the ground and personal debt guarantees. Why haven’t SIX investors noticed this yet? This project appears to have slipped through the cracks and Six Flags investors are not yet aware. There is no mention of it in the Bloomberg news feed and no sellsider has written about the new park’s potential impact on Six Flags. While the resumption of construction has been widely reported in local New Jersey press in the past month, no one seems to have connected the dots on how this may impact Six Flags. We think the lack of awareness may stem from 1) the project was only recently re-configured to focus on theme/water park and entertainment, 2) American Dream only recently restarted construction and completed full financing to completion, 3) Six Flags has never mentioned this on an investor call, and investors may not be actively watching out for competitive threats as there hasn’t been a competitive park build for a long time. 2) How does this threaten Six Flags Great Adventure’s population basin? The American Dream project is situated right in between Great Adventure and its primary population basin in the tri-state area. Customers from the NY/NJ/CT tri-state area would need to drive right past this new complex and continue 1 hour to reach Great Adventure. In its most recent 10K, SIX describes the relevant population basin as 13.8m people within 50miles & 29.6m within 100miles. The majority of the 50mi & 100mi population is the NY Metro Area, with a smaller cluster in the Philadelphia area. The New York MSA has 20.2m people. Manhattan is 1hr 23min to Great Adventure. Philadelphia is a 1hr 8min drive to Great Adventure. 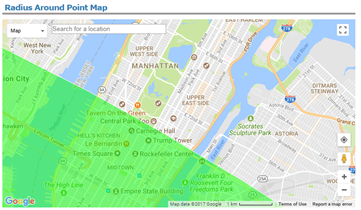 Great Adventure’s 50 mile radius extends all the way into the middle of Manhattan, capturing all of Brooklyn, Staten Island, and the NJ suburbs. The 100 mi radius of course captures the entire tri-state area. The majority of Great Adventures population basin will need to drive past this new American Dream complex and continue an hour south if they want to go to Six Flags. Attendance from the Philadelphia basin could also see a significant impact. From the center of Philly, Six Flags is a 1 hour drive and American Dream is a 1.5 hours drive. 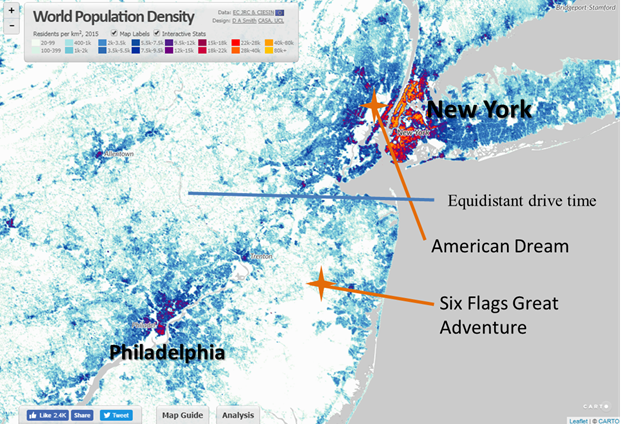 If we assume a portion of NY/NJ area folks are willing to drive an extra hour past American Dream to go to Six Flags, it stands to reason a portion of Philly folks would be willing to drive an extra half hour to American Dream. 3) How meaningfully could this impact Six Flags Great Adventure’s attendance? The geography/population issue discussed above is a problem for SIX as American Dream will be significantly closer for the majority of Great Adventure’s base. But there also might be a preference issue. American Dream may be a more attractive alternative for some. 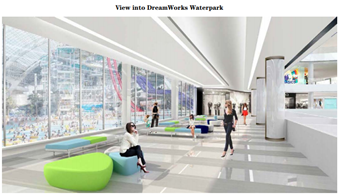 The diversity of options at American Dream seems attractive for families. Dad can take the young ones to Kidzania, or LegoLand, or the Aquarium, while mom can take the older ones to the rollercoasters or waterpark. You can eat lunch at a wide variety of restaurants. You can go shopping on the way in our out. There are plans for a wristband device that would allow parents to see where their kids are and speak through the wristband. 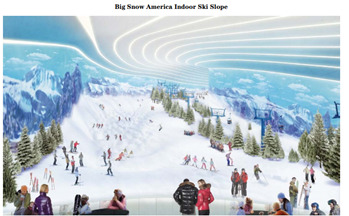 You could drop your kids and go shopping, or sit in the bar, or go skiing at the indoor slope! And American Dream will be brand-new, while Great Adventure is in good shape, but is 43 years old. There will certainly continue to be parkgoers who prefer Six Flags and are willing to drive longer distances to get there. People who love extreme rollercoasters in particular will not find anything as exceptional as SIX’s Kingda Ka at the American Dream. American Dream’s year-round operations also present a risk. American Dream will compete directly with SIX for attendees during Great Adventure's operating season. But it is glass-enclosed and will also be open year-round, satiating theme park demand every day. If a family was at the rollercoaster or water park in November and April, they might have less demand to drive to a Six Flags in the summer. It is difficult to find modern examples of the impact of new park openings on existing parks, mainly because there have not been many new parks opened in recent decades. The ones that have are poor comparisons. For instance a LegoLand opened in central Florida, it probably did negatively impact attendance at Busch Gardens Tampa, but geographically and demographically it was only an ancillary threat. Geographically – Busch Gardens Tampa sits right in downtown Tampa, surrounded by its population basin. The typical Busch attendee is making a 15 minute mini-trip, not packing up a car for a long haul. The new LegoLand is an hour and 10 minute drive outside of Tampa into rural central Florida. It’s pretty far away, and was designed as a destination park aiming to draw tourists, rather than a regional theme park aimed at Tampa’s population. The Legoland is actually 20 minutes closer to Disney World Orlando than Busch Gardens Tampa. Demographically – LegoLand is designed for a much younger audience than Busch Gardens (which is named after a beer company after all). There’s certainly some overlap at the fringes, but not that much. Regional gaming provides a good read-across. Like regional theme parks, regional gaming caters to a local driving distance population. As such, the potential audience is somewhat capped and already fully penetrated by the incumbent. This is in contrast to destination parks (Orlando) or destination gaming (Las Vegas) where new projects can draw more tourism to the area. A quick look at Atlantic City over the past few years since casinos opened in Pennsylvania is informative. The Hollywood Casino at Charles Town in West Virgina has some similarities to Six Flags Great Adventure. Charles Town draws visitation from the Washington, DC area, which is a 1hr15min drive away. It was negatively impacted when a new casino opened 45 minutes from DC called Maryland Live! Maryland Live! opened slots in June 2012, table games in April ’13 and poker in August ’13. The impact? According to State of West Virginia gross gaming revenue disclosures -- Charles Town did $540m of revenue in 2012 prior to competition and $393m in 2014 after the first full year of Maryland Live! competition. A revenue decline of almost 30%. Revenue has continued to fall every year since, and Charles Town was down to $371m in 2016, with 2017 YTD declining an additional 10% so far – a 40% cumulative revenue decline since new competition entered. The increased rate of decline in 2017 is due to a new casino opening in Maryland just 20 minutes outside of DC, which feels a lot more analogous to the American Dream / Six Flags situation. Another example might be the Hollywood Casino Lawrenceburg which is 30min outside Cincinnati. A new Horseshoe casino opened in Cincinnati in 2013, and Lawrenceburg’s revenues per State of Indiana discloures have fallen 60% and declined every year since the competitive opening. We have commissioned a panel-based survey of consumers who attended Six Flags Great Adventure in 2016 or 2017. The results are still coming in, but based on preliminary results with a sample size of >1,000 so far, 48.7% of respondents believe the American Dream project would reduce their visits to Six Flags Great Adventure. We will update this after full results come in and we analyze the data. This survey measures consumer expectations based only on the panelists reading a two paragraph description of the new American Dreams project. The anticipated impact may increase as we get closer to opening and American Dream launches an advertising campaign to raise awareness. It might also increase after the park is open and attendees actually visit. Bottom Line – it is difficult to accurately predict the impact. After some analysis and speaking with some theme park industry experts we are analyzing a range of attendance impact at Great Adventure of 20-40%. That’s admittedly a very wide range. 4) How big is Great Adventure within SIX? We believe Great Adventure is a little over 20% of SIX’s total theme park revenues, or roughly $275m or revenue. It is generally understood that Great America is the largest park within SIX’s portfolio, but the company hasn’t disclosed exact numbers. These figures directionally make sense as those 4 parks are understood to be the largest and there used to be a rule of thumb that the 4 largest parks comprise 50% of revenue. These 4 also have attached water parks, and relatively high price points. 2017 consensus revenue is ~$1.4B, of which ~$1.3B are in-park revenues. 21.2% suggests just over $275m of 2017 revenue from Great Adventure. For the purpose of simplicity we are ignoring the sponsorship/licensing bucket, though sponsorship values would also be impacted if attendance fell. 5) How much of an impact would this be to cash flow? The big issue for Six Flags is it has piled financial leverage on top of very high operational leverage. When things are good, this amplifies equity upside and it’s a great decision. But if attendance is hit, leverage upon leverage will cut the other direction. Operational leverage – any revenue loss would likely fall straight to the bottom line. The cost of running a themepark is nearly all fixed, with very little variable costs aside from maybe advertising, which is only around 5% of revenue, and you might actually need to expand advertising spend if attendance is under threat. Fixed costs tend to grow with inflation regardless of revenue, great upside when parks grow faster than inflation, and very tough when they don’t. Financial leverage. SIX has approximately $2B net debt, or 3.6x EBITDA, pro forma for April’s decision to issue an additional $400m debt and repurchase $300m of stock from H Partners. With financial leverage sitting on top of operating leverage, we estimate below that a 20-40% hit to attendance at Great Adventure would impair total SIX free cash flow by 20.6-41.3%. Note these free cash flow numbers are all still pre-tax. In 2017 SIX will be consuming the last of its federal tax net operating loss carryforwards. I should note the stock comp, as sometimes people forget it. SIX issues a lot of stock compensation and this is a very real expense though it is often ignored. SIX uses real cash to then repurchase the issued shares and prevent diluting shareholders. 6) Taxes will also hit in 2018/2019. SIX has not been paying federal taxes ever since emerging from bankruptcy in 2010. Investors have become accustomed to the extra free cash flow. Both that bankruptcy and the decade of losses that led into it are a good reminder of the risk this business faces during difficult times if it is overleveraged. That will change in 2018/9 as the NOLs are used up and SIX returns to being a normal taxpayer. Given it’s footprint is largely US, it should eventually normalize to the 35-40% tax rate we see in other US-centric businesses such as retailers and movie theaters. Taxes will be a further 30-35% hit to equity value and free cash flow. (Six is already paying ~5% tax on a state and local basis). Investors should be aware of this, but they don’t appear to be factoring it in with SIX’s valuation at 17x EBITDA minus Capex and 45x trailing earnings (before any of these impacts). Extending our table above to incorporate the tax hit, we think by 2019 investors will face a 46-60% reduction in free cash flow. The stage 1 impact from the American Dream project requires an assumption on how significant the impact on Great Adventure will be. The stage 2 impact from taxes is simply the math on what the IRS requires from American businesses when they do not have net operating losses to offset taxable profit. SIX’s current dividend amounts to $225 million per year and seems to be at risk in these scenarios. Very interesting article. I still have very high doubts of a 2019 American Dream completion, and I also think they are over-estimating its impact on GAdv. Still, it will be interesting to see how SF reacts to the move and they make us a higher priority the next few years. I also don't think it will hurt Great Adventure that much. 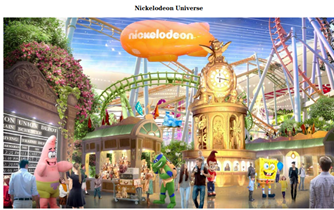 If the ride lineup is similar to the Nickelodeon Universe at Mall of America there will only be 1 or 2 thrill coasters with a few thrilling flats and the rest being family and kiddie rides. Maybe it will take away some of the families with young kids but for teens and adults, I don't see this park stopping them from going to Great Adventure. An annual pass if offered will likely be much more expensive than Great Adventure which might keep people away. At Mall of America, it is $139, over twice as much as Great Adventure and could even be more at this location, so close to NYC. I will still plan to visit once the park opens (and depending on the coasters they install) but only in January or February when there are no other parks in the area open. I almost posted that the other day, but there are several errors in the article where they start calling the park Great America. Making simple errors like that made me question the credibility of all of their research, but the credit card transactions by park was interesting to see. It would be nice to see data on the impact of MOA on Valleyfair. Personally, I think Six Flags needs to worry more about the Legoland park in New York and the impact it will have on families coming to Great Adventure and Great Escape. Jim Reid-Anderson just addressed this article directly during the Q&A on the Q2 Earnings Call and said Six Flags isn't concerned about the Meadowlands development at all and doesn't believe it will have an impact on Six Flags parks. That park is never going to open, like everything else proprosed at that Xanadu site. And if it does, it won't put much of a hurt on Great Adventure. The 43 year head start helps. I will believe this place gets finished the day I open the news paper and see a picture of the ribbon getting cut. Even if it does open that's not to say it wont close due to it being a complete failure. The fact someone is still willing to dump money into the place is crazy. Didn't know they don't pay taxes. Buying Water World sounds like a bad idea now. They didn't buy Water World, it is more of a lease/operating agreement with the REIT that owns it. They said this morning that they expect to become a taxpayer sometime in 2019. Several water park operators reached out to Six Flags after the new water park strategy was announced and Six Flags is currently evaluating several deals to take over water parks in the US. Regardless of what one thinks as to the likelihood of American Dream actually opening, the projected decline in attendance (and revenues overall for Six Flags) are significant even if they do not meet the low-end projections of a 20% decline. A sustained decline of 15% to Great Adventure the year American Dream opens could be devastating to both the park and the company if it continued for multiple seasons. Again, Great Adventure's decreased offerings and resulting diminished broad appeal to a larger customer base could really be a problem for the park and the company. I certainly HOPE that Reid-Anderson is not dismissing this potential competitor out of hand. Medusa42, I think you may be incorrect in your assertion that the article mistakenly referred to Great Adventure as Great America. While Great Adventure is easily the company's largest property and can generate the biggest revenues and profits from season to season, I believe Great America has been more consistent as a money maker. Consider profitability contributed on average for Great Adventure from 1977 to present to Great America from 1984 to present and I think Great America will appear more stable in that regard. These are the parts that bothered me. The writer seems confused about the name of the park and clearly meant to say Great Adventure here. This has to be an error because they contradict the statement about Great America with the data presented below it. Isn't Legoland NY also opening in 2019. Guess that will have more of a impact on SF Great Escape and SF New England. The following Three Theme Parks are Planned to open in 2019. Atlantic City Theme Park(67 miles from GA), DreamWorld(67 miles from GA) and Legoland NY(120 miles from GA). Six Flags might want to start planning something Hugh for 2019, how about the world's Tallest, Fastest and Longest coaster in the world with a total of 21 Loops. The coaster could start out along the Lake, Run South to AC then along the Ocean, over Legoland, over Giants Stadium and ending near the old FreeFall. The AC park will never happen. Xanadu will have some residual effect, but I don't see a lot of overlap between the two parks. This isn't like Delaware and Pennsylvania casinos putting the hurt of AC. Here is the quote from the transcript of the Q2 2017 Earnings Call. Christopher Prykull - Goldman Sachs & Co.
Great. And then Jim, you had mentioned earlier sort of one of the strengths of the amusement park space or the regional space is sort of limited capacity growth over the past 5 or 10 years. Is there any park or leisure projects that are either under way or potentially in the planning stages that you are keeping an eye on that could potentially have an impact on Six's attendance at existing parks? James W. P. Reid-Anderson - Six Flags Entertainment Corp. I have to tell you Chris, we keep an eye on everything, we watch. As a good managing team, it's our job to make sure we know what's going on in our local markets. Because the truth is that other theme parks are not really our competitors. There are other activities that provide an alternative for people who would come to theme parks. And our goal is to take that – we want as much a share of people's wallets as we can get. So there is nothing out there that is concerning us. I will address head-on what I think is the source of your question which is there was a recently announced news that came out about some park opening in the Meadowlands (38:45). And the reality is that this project is in essence, a mall that happens to have a ski slope, a small kids' park and is absolutely not in competition with anything that we do at any of our parks including Great Adventure. Very small in scale, indoors, not comparable. And I think it's remarkable if you pull up and you look at the last 20, 30 years, there hasn't been a successful new theme park that has opened in the whole United States at all. In fact, the ones that have opened have pretty much crumbled. So this market is as rock solid, bullet proof as it gets. And if there is someone coming at us, that will open up a park next door or close by, we'll have four to five years to be able to prepare for that. But there is zero on the horizon right now. I think the AC Park has the best chance of opening out of the three. I find one sentence of Mr. Reid-Anderson's answers to be particularly nonsensical and disturbing. That sentence is "Because the truth is that other theme parks are not really our competitors." Why, then, do you include a number of theme parks (both in the same inner and outer markets) as competitors in your annual report together with the description of each Six Flags park property? Nothing much (good) ever gets done in AC because of politics. Stockton University had plans to buy the old Showboat when that casino closed, and then turn it into classrooms and a hotel (for its Hospitality and Tourism program, which my daughter graduated from). The plan was scuttled by another casino. Now the mayor is up for election in November, so I can't imagine anything will happen until well after that, and then it will depend on who wins the seat. I pray that the park happens, because the area needs it, and I like going there (I was just there a couple days ago). Regarding GA losing revenue because of Xanadu, would it be such a bad thing to lose the type of consumer that would switch to Xanadu because of proximity? I realize every attendee brings revenue, but certain types also bring a host of problems, many that have been mentioned on this site previously. This is essentially why I stopped going to the park in the late 80s and 90s, because it lost its family fun identity, and there were times I was actually concerned for my safety. If I understand this correctly, they're using credit card information to determine each park's "size"? And by "size", it seems they mean revenue? So they're using how much a park spends to determine how much it makes, relative to the other parks? Doesn't seem like a good method considering parks are spread accross different markets, with varying costs of living. Some must have unnaturally higher expenses than others of the same revenue. I assumed the credit card information was for guest spending and not the spending of the park. I doubt the parks purchase much of anything using a credit card. They likely have accounts with the suppliers. Ah, got it. How do they get that information? Yeah, they are looking at guest credit card transactions that can be linked to Six Flags or each park. It is the first time I have seen someone claim Fiesta Texas is one of the top four parks in the chain. Here is an interesting bit of info I found on Great America's ticket sales. The village's 3 percent amusement tax on Great America tickets accounted for most of the category's budgeted income of $1.9 million in 2015-16. So Great America probably sells $62-63 million worth of tickets per year. I don't know why everyone is under the impression that this "element" our park attracts is from NYC. Newark, Jersey City, Paterson, East Orange, Elizabeth, Camden, Asbury, Atlantic City, and many other NJ towns/cities (including Long Branch, where a guy was shot and killed last week less than 1000ft from my doorstep last week) are where the majority of this "element" comes from. And this group tends to be thrill-seekers, not Nickelodeon Universe type of visitors. SF's SP pricepoint is also perfect for lower income guests (such as myself) to be repeat customers.